Amazon are approved installers of Dales Nene sectional gutter system. An attractive heavy duty aluminium system of elegant simplicity. Its wide throat means that a wide variety of eaves configurations can be accommodated. 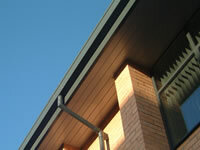 This example utilises Dales Aluminium Building Products’ Kwikfix Fascia & Soffit System. 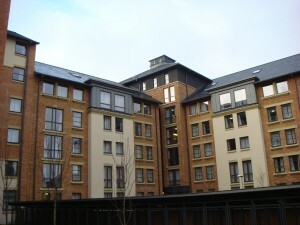 The system is complemented by Dales’ Sectional Nene gutter and rainwater products. The fascia is available in any depth to suit site conditions and the profile of the secret fix plank system allows material thickness to be kept to a minimum whilst manufacturing techniques allow them to be modulated to suit any width of soffit. Full specification of this sectional gutter system can be viewed here as a PDF. Nordal offers all the familiar benefits associated with aluminium guttering systems: low maintenabnce, lightweight, colour treated and long life plus low cost. This system is only available in black. 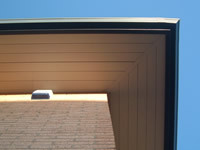 Also see ARP and Marley sectional gutter systems.